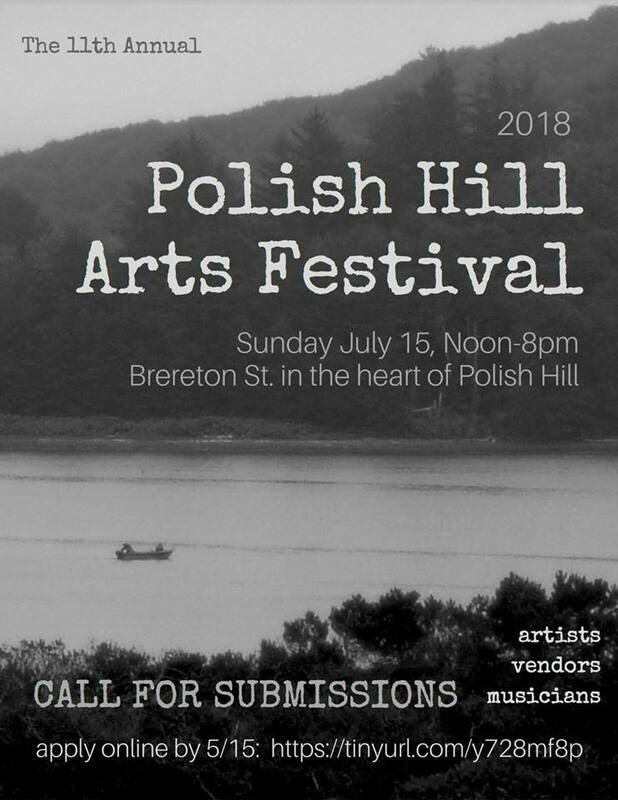 The 11th annual Polish Hill Arts Fest promises to be one of the best yet with 40+ artists selling unique and handmade products, live music, fantastic food and hands-on activities for kids of all ages. We’d like YOU to be part of the 2017 Arts Festival!! The Polish Hill Arts Fest is one of the city’s liveliest summer events. The Fest attracts people of all ages from across the city and includes a broad range of vendors from fine craftspeople to young, local artists. Live music, unique performances and fun activities for the kiddos. Plus, we always have amazing local food vendors. This year, for the first time, the Arts Fest is 100% volunteer-run. And (as always) we look to you to help us make it happen. Sunday, July 16th, noon to 9pm (this’ll be awesome, just wait). Art All Night is just two weeks away! Art All Night is Lawrenceville’s annual celebration of arts and community, a grassroots event staged by an all-volunteer crew, and a popular event which brings thousands of people from all over the region into Lawrenceville. This public art show begins Saturday afternoon, April 26th at 4:00 p.m. and continues through the night, until Sunday afternoon at 2:00 p.m. Anyone may submit one piece of artwork to hang in the show. There is no fee, no jury, and no censorship. 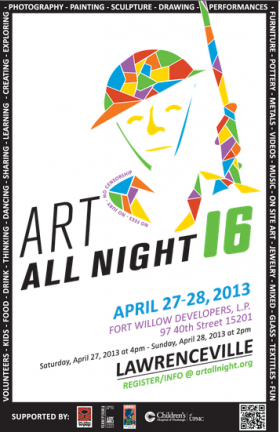 Each year Art All Night displays about 1,200 pieces of art created by local artists of all types and abilities. There are also opportunities to volunteer. To learn more about the event, including this year’s location, how to register artwork, and information about handicap accessibility, please visit the event website, or follow on Twitter or Facebook. In celebration of Bike Pittsburgh’s BikeFest 2013, the Office of Public Art is hosting a public art ride from the North Shore to Millvale along the Allegheny Riverfront Trail on Tuesday, August 13. The ride will start at 6:00 p.m. and end at 8:30. The ride will visit the Langley Observatory Clock by R.M. Fischer and experience an in-depth tour of the Maxo Vanka murals inside of Millvale’s St. Nicholas Croatian Catholic Church. The ride will be 10 miles, round trip. Register in advance for just $7. Register online or call 412.391.2060 ext. 237. Register on-site the day of the event for $10. Participants should meet at the Langley Observatory Clock, Allegheny Avenue Plaza, North Shore Riverfront Park. The tour happens rain or shine, but extreme weather (lightning or tornado)would result in cancellation. For more information, please visit publicartpittsburgh.org. Assemble, a community space for arts and technology, is excited to announce its second annual MakerDate fundraising event. On Saturday, May 18 at 6119 Penn Ave in East Liberty, Assemble will host an action packed evening highlighted by the MakerDate auction. The event pairs local artists with skill seekers of all ages to further Assemble’s mission of building community through active learning. Since its inception in 2011, Assemble has been host to a wide variety of learning and creative experiences in Pittsburgh. It is the organization’s belief that curiosity breeds creativity, and intrigue is best satisfied through hands-on activities. In true form, the MakerDate event takes the concept of date auctioning and re-dresses it with a purpose, pairing skilled creators with those that want to learn something new. Attendees will have the unique chance to bid on dates with artists, craft makers, designers, innovators and skill-owners who will work with the winning bidders to make a piece of art, a personalized piece of technology, or teach a new skill. The dates will take place after the event at a time and place determined by the maker and winning bidder. The event will feature 15 Makers for the live auction and will also include items donated by a number of local artisans, creators, and businesses for a raffle. 2012’s inaugural event attracted more than 100 attendees and raised over $4,000 to fund educational programs and events at Assemble. This year’s event promises to be bigger and bolder, raising funds for Assembles community focused initiatives. Click here for more information, including a list of this year’s Makers. Contact Assemble here. Art All Night is Lawrenceville’s annual celebration of arts and community. This public art show begins Saturday afternoon, April 27th at 4 pm, and continues through the night, until Sunday afternoon at 2 p.m. Admission is FREE, and they will have plenty of activities to engage participants of all ages! Additionally, artists are invited to submit one piece of artwork to hang in the show. There is no fee, no jury, and no censorship. Each year at Art All Night, about 1,200 pieces of art are displayed by local artists of all types and abilities. Click here for artist registration information. To learn more about the event, including this year’s location, how to register artwork, and information about handicap accessibility, please visit their website (www.artallnight.org), follow them on Twitter or Facebook. RADical Days are here: get out there and check out what Pittsburgh has to offer — free! The Allegheny Regional Asset District – or RAD – is your local sales tax dollars in support of our regional libraries, parks and trails, sports facilities, and arts and culture. Since 1994, RAD has funded more than $1.3 billion in grants to places and to organizations that create a positive impact on the lives of residents of and visitors to Allegheny County. RADical Days is a “thank you” to the public for its support of the assets through RAD. Frick Art and Historical Center: free family activities including scavenger hunts, games and art activities. Young Men and Women’s African Heritage Association: Nia Quilt Guild, and music by the Nia Steel Pan Drum Ensemble. Hartwood Acres Hay Day: hayrides, pony rides, petting zoo, music, arts and crafts, book fair, and food vendors. Heinz History Center: In addition to the museum collection and the Sports History Museum, there will be performances by the Pittsburgh Academy of Musical Theater, Pittsburgh Youth Ballet, and the South Hills Chorale. National Aviary: did you know they have a penguin colony here? Children’s Museum: all the usual fun, and performances by the Pittsburgh Symphony Orchestra and Fiddlesticks, and the Bulgarian Dance Troupe Otets Paissii. Carnegie Main Library: Cy Hungerford exhibit and discussion. That’s just this weekend — there are things to do every day — on weekends, many things — through October 13. 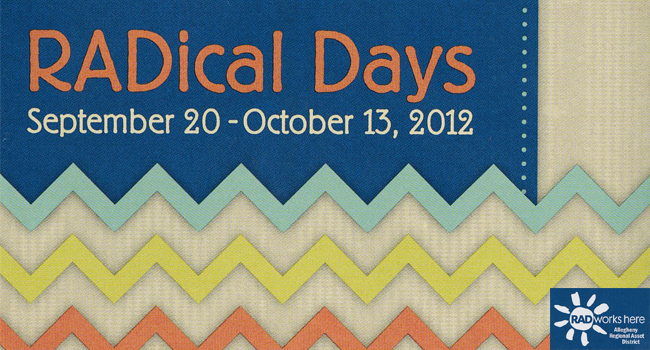 To see the whole RADical Days schedule and information, click here or visit the PHCA office to pick up a brochure. Project Lido is a presentation of outdoor art installations in the former Leslie Pool in Lawrenceville — with other activities, events, and fun stuff to go along with it — all free! On Sunday, August 19 from noon to 5 pm, there will be a pre-opening Art Activity Day with lots of fun things to do for the whole family. You can visit with the artists as they work on-site, play in an interactive installation by Mattress Factory – Museum of Contemporary Art, learn about green energy design, or make your own structure from paper tubes and tape. The official opening reception is on Thursday August 30 from 7-10 pm. There will also be other workshops, events, and weekend viewings. 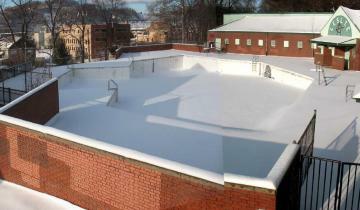 Check out the Lido information page or Leslie Park Pool Collective Facebook page for event information. Polish Hill has a lot of artists, but not a lot of art shows (although Lili Coffee* has great exhibits, like the one of punk show photographs currently on view). But there will be a big show right on our northern border. The Warhol Museum brings it’s Factory Direct: Pittsburgh show to the sixth-floor event/exhibition space at the Guardian Storage building, at 2839 Liberty Avenue. 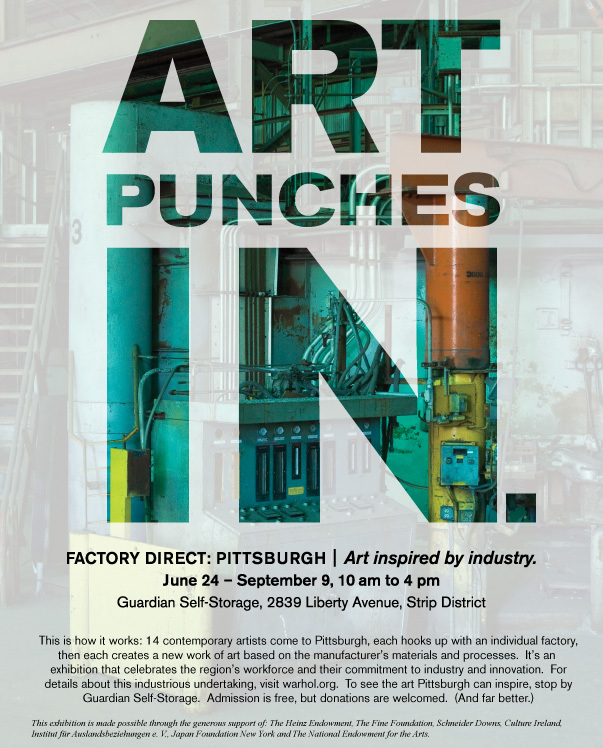 The show is described as “Art inspired by industry”, and this is how it works: 14 contemporary artists come to Pittsburgh, each hooks up with an individual factory, then each creates a new work of art based on the manufacturer’s materials and processes. It’s an exhibition that celebrates the region’s workforce and their commitment to industry and innovation. The exhibit opens on June 24, and runs through September 9. Admission is free, but donations are welcomed. Click here for more details about the show.